NISA, or for those who are recently joined readers, the Nuclear and Industrial Safety Agency, has instructed TEPCO (Tokyo Electric Power Company) to make a very thorough analysis of various parameters relative to TEPCO's plan to flood the dry well of Fukushima Daiichi No. 1 to a level above that of the active fuel region inside the pressure vessel. It is beginning to look as if NISA seriously questions this move... not in terms of restoration of core cooling, but rather in terms of building safety and more importantly (and directly) reactor safety in the event of a further earthquake, taking into consideration the large increase in mass that this much water will add to the dry well structure. This is perhaps one of those watershed moments, because if TEPCO finds that this plan is not safe in this seismic environment (or if NISA doesn't like TEPCO's answer and stops the plan anyway) then this will entirely derail TEPCO's sole plan to restore core cooling in a timely manner. Here is the content of the NISA letter to TEPCO, dated April 30, 2011.
the appropriateness of an emergency measure planned by TEPCO. of fuel range in Unit 1 of Fukushima Daiichi Nuclear Power Station. 2.impact from the pressure increase inside primary containment vessel. possibility of leakage to outside environment. This is a pivotal report for the movement of plant recovery forward, so we will be watching for the response and have it up here as soon as we see it. Relatively lost in the tragedy in the southern part of the USA is the fact that Browns Ferry experienced a total Loss Of Offsite Power, causing all three reactor plants to shut down. No. 1 and No. 2 plants were operating at 75% power, while No. 3 was at 100% power when the tornado damage caused a complete LOOP that generated trip signals on all three plants. All shutdown immediate actions were normal except for No. 3 plant; one MSIV or Main Steam Isolation Valve is indicating intermediate... meaning it's neither on the open seat or on the closed seat. All site diesels except one which was down for maintenance started and ran normally. The LOOP caused valid RPS signals, PCIS actuation and the mentioned EDG start. RPS signals of course included full scram. Although the plants were using RCIC, on No. 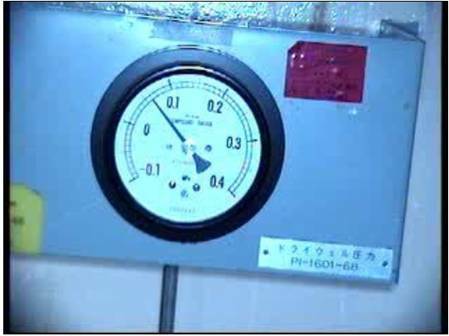 1 the water level did reach -45 inches causing the HPIC system to actuate to restore water level in the reactor pressure vessel. All three plants are in hot shutdown at this time. These events began at 5:01 PM on the 27th. 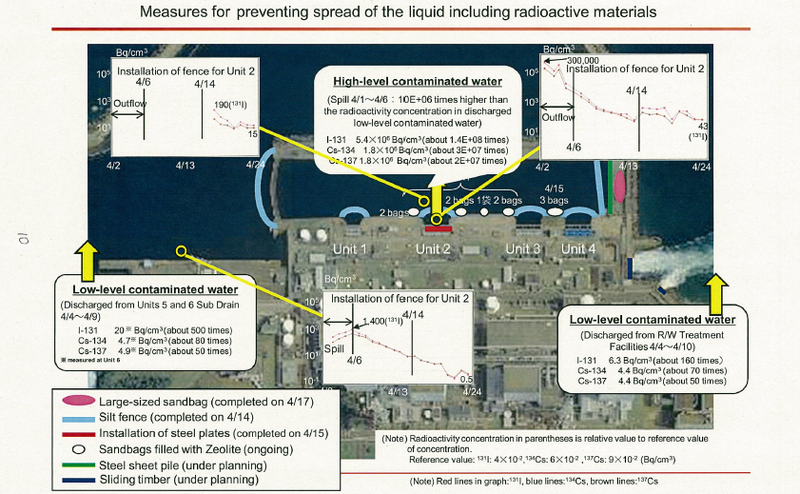 A few new details from Fukushima Daiichi... TEPCO has released a very brief look into the spent fuel pool at No. 4 plant. TEPCO has reduced the water injection rate back to the long-held six cubic meters per hour at No. 1 plant while it ascertains conditions. Robot inspections of the reactor building seem to confirm that the primary containment (dry well) is not leaking water. Temperatures continue to lower at this plant; they had lowered impressively while the water injection was at the highest rate of fourteen cubic meters per hour. According to one press report (but not direct information from TEPCO) nitrogen injection to No. 1 plant has recommenced. 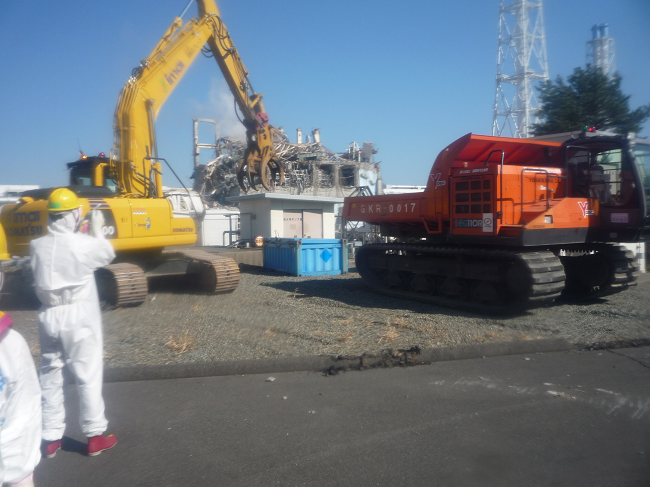 The spraying of dust-inhibiting or "anti scattering" compound is now in full swing, and remote-controlled equipment is now being used during most daylight hours to remove radioactively contaminated debris from the area of the reactor buildings. Below, a TEPCO press release photo taken by No. 1 reactor building showing temporary power cables running across an access road. 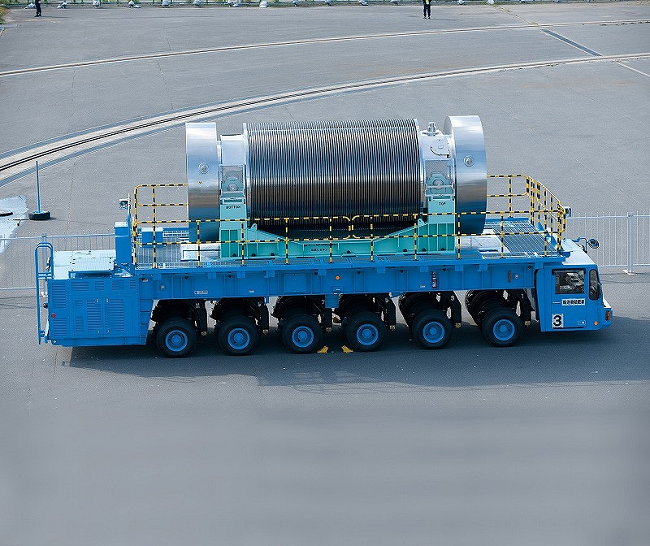 Note the heavy steel plate protectors being used to allow the tracked, remotely controlled heavy equipment to pass over the cables. such as fire pumps and seawater injection, etc. It was noted in the NISA order that these are necessary for NISA to ensure that TEPCO takes appropriate steps from here on out. Clearly, in addition to this, NISA wants to know the details of the several mentioned (and presently not functioning) core cooling systems to see what it can glean from this information (Isolation Condenser Cooling, HPCI, RCIC). It also wants records of relief valve lifts. We don't want to start name calling early, but these sorts of orders continuing to occur are beginning to make it seem as if NISA is suspicious of TEPCO's management, or else is suspicious of its transparency, or at least suspicious of TEPCO's ability to collect and report this sort of data to it and the press. There is some data being updated a few times a day, which is mainly concerned with a few operable remotely indicated parameters, but this list is far more extensive than what is being reported now and has been detailed in immediate actions after the tsunami. 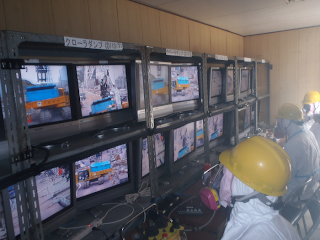 Here are some interesting official TEPCO pictures of the kinds of equipment being used on site, with our commentary. 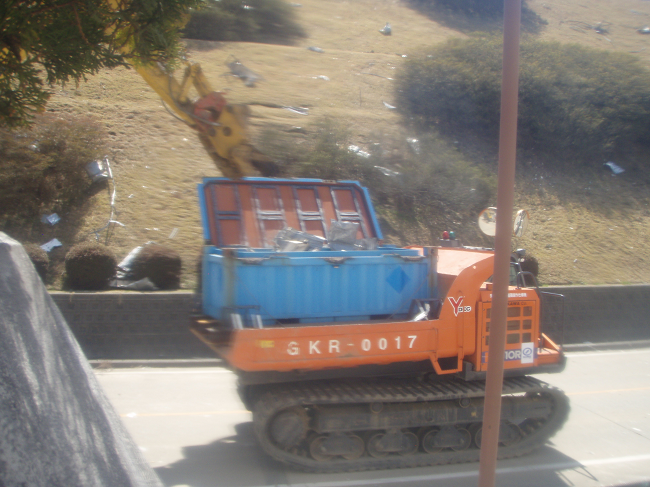 We've already seen the excavators being used; here is one style of crawler dump carrier being used to haul containers of rubble to the temporary storage ground. In this view, the excavator has filled the container on the carrier vehicle and is about to shut the lid of the container. This style of carrier vehicle is the Hitachi EG110R, specially fitted with remote control gear. CLICK HERE to see the Hitachi sales brochure for this piece of equipment. Here is a view showing one of these EG110R trucks having dropped off a container. Remember, all photos can be clicked on and enlarged. There is another model of carrier vehicle in use on site, but we haven't figured out the make and model yet. They're green. Note that this one appears to be carrying some sort of water tank with a water cannon on top of it. Note also the camera mounted on the hood. 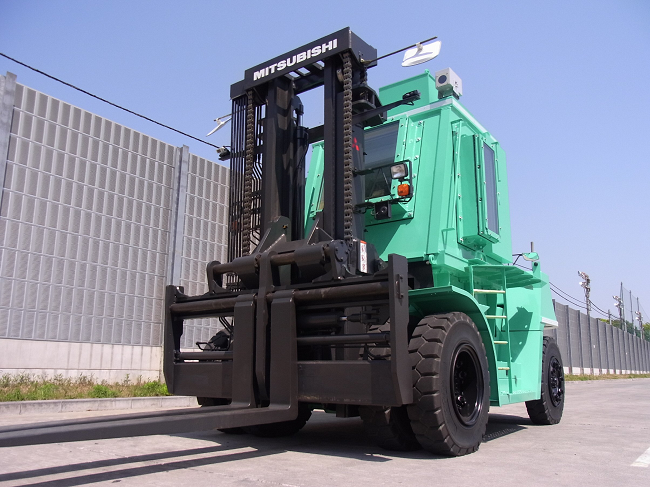 Mitsubishi has produced a modified heavy fork lift truck with lead shielded cab for use at the site, and released a press photo of the machine which TEPCO has also released. It appears to be the first manned design for use on site; we might think of this as a 'second generation' of modified equipment for the site. Finally, not in use now but possibly later.. a spent fuel cask carrying vehicle with a capacity of 38 metric tons. This press photo was posted by TEPCO for reasons unknown... probably, it was to show the kind of vehicle one might expect to be used to carry highly contaminated parts that need to be moved in a shielded, and protective, cask. Labels: "equipment", "fukushima daiichi", "hitachi", "mitsubishi"
TEPCO, according to NHK, has revised its fuel damage estimates for the three reactor plants at Fukushima Daiichi with installed cores. TEPCO now says fuel damage percentage at No. 1 plant is 55%, not the 70% it had first thought. This is a lot closer to the NRC estimate in the mid-60's. No. 2 and No. 3 plant have now apparently been rounded up to 35% and 30% respectively. These revisions have been made, in the case of the first plant, because TEPCO hasn't found the rad levels it would expect if there were as much as 70% of the fuel damaged in the reactor core. In the other two cases, TEPCO seems to have admitted having erred in rounding initially so it gave the other two plants the extra five percent each. The triggering for this re-estimation seems to have been a prodding from NISA, who felt that the estimate for No. 1 plant was incorrect based on reported rad levels, according to JAIF. Labels: "fukushima daiichi", "JAIF", "NISA", "TEPCO"
TEPCO will be increasing the amount of water injected to No. 1 plant incrementally and checking the results, preparatory to filling the primary containment (dry well) high enough to cover the fuel rods. 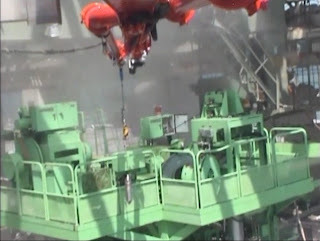 Prior to doing this, they sent the robots in for a more detailed search and TEPCO has released for press use four photos of the robots' tour in No. 1 reactor building. 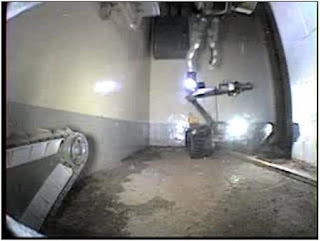 Below, one robot photographs another about to enter a pump room. Next, a robot's camera looks at a local gauge reading dry well pressure - it appears to be 0.06 mPa. Here is a shot taken of electrical cable conduit running to the dry well. They're looking for water leakage from the penetration, through or near the cable way. Finally, a shot of a large equipment access hatch, again looking for water leakage. TEPCO has released the fact that the robots detected a rad field of 112 R/hr inside the No. 1 reactor building, although it is not apparent just where this was. In another development, TEPCO is becoming sure that the spent fuel pool at No. 4 plant is leaking somewhere, since the rate at which it's adding water can't be evaporating fast enough to account for the daily level loss. You'd have to wonder if the pool is cracked, or a spent fuel pool cooling system pipe leaking from quake / hydrogen burn damage. Labels: "fukushima daiichi", "robot", "TEPCO"
We've examined some of the reasons why the Chernobyl accident happened, and some of the plant design features here on this blog. What's really left is to try to give a brief idea of one nagging question: Given their apparent competence in many ways, how did the overall Soviet nuclear energy establishment ever get to the point not just of having one RBMK-1000 reactor that then had an accident, but a multitude of these dangerous plants all over the place? To figure that out we will look briefly at two sources (see note at end) and look briefly at Soviet reactor development. Many countries experimented with atomic piles -- in the original sense -- and these of course developed directly into large graphite moderated reactors for weapons material production in a number of countries. In the USSR, this design path apparently was also selected for their first commercial atomic power station. This project was very early; it was started in 1949. This core design offered attractive possibilities, compared with other types including very importantly the ability to produce weapons-grade plutonium while producing energy. Further, these reactors could be designed to superheat steam, raising plant overall efficiency. They could also be refueled while critical and on line, making availability theoretically very high compared to other types of nuclear plants. For these reasons, design work forged ahead on this concept. In 1958 the "Siberian plant" went into operation. This was a highly classified weapons production plant using, again, channel type graphite moderated reactors and this, while classified, did add to the Soviet knowledge with this type of reactor. The next power-production plant of this general type to be constructed was at Beloyarsk. 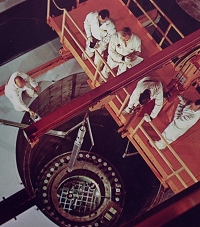 The first reactor on this site was placed in commercial operation in April 1964 after much design work. The reactor was much larger than the one built at Obninsk, and larger than the six at the Siberian plant. 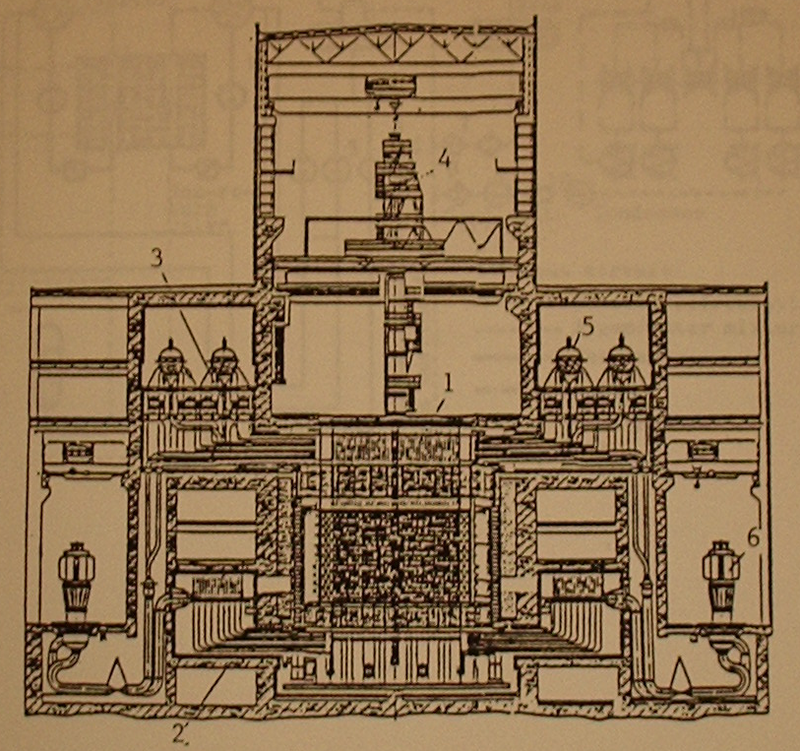 This reactor used a two-pass BWR circuit in which during the first pass the water was brought to saturation, and boiled; in the second pass second-circuit steam was superheated. The first LWGR at this site was rated 285 MWt / 100 MWe. The high effieciency was due to the degree of superheat. Experiments with the original commercial 5 MWe plant's core, inserting test boiling fuel elements (instead of the original pressurized water non-boiling elements) led the Soviet designers to the realization that this concept could be made to work. This was the fundamental change between the prototype plant and the Beloyarsk plant. 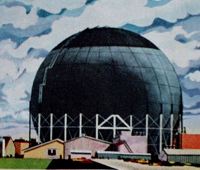 The reactor core of this plant had a diameter of 283 inches and a height of 236 inches. It contained 730 steam-water heating fuel assemblies and 268 superheating fuel assemblies. The superheat assemblies were in an annular region, with boiling elements inside of and outside of them. This was said to be in the region where they would affect reactivity the least. This reactor plant used a very complicated flow pattern for the water/steam. Basically, water entered the boiling fuel elements and the discharge of these was taken to a drum, where steam was separated and sent to a preheater/evaporator unit. It gave its heat off to secondary water in this unit, and was then returned to the feed and preheating system. Meanwhile water on the secondary side of that preheater/evaporator was boiled off, and the steam sent through the superheat elements in the reactor. From there it went out of the reactor enclosure proper and on to the turbine and auxiliary systems. This is vaguely analogous to the complicated dual-cycle BWR concept GE used at Dresden-1, although not exactly; it's an early example of an overly complicated system for sure. Here is a view of the first plant built at Beloyarsk. Note the resemblance to the much later RBMK-1000 plant you've seen on this site before. Although the original plan was to have four identical reactor plants at Beloyarsk, design revisions took place and the next reactor at the site to come on line, No. 2, was larger and yet simpler. The on line date for this plant was October 1967. This plant used a single flow for both boiling and then superheating, and was rated 530 MWt / 200 MWe. This plant was also classified generally as an LWGR plant, even though the design was not yet standardized. No further LWGR's were built at this site; it appears the Soviets placed two other design plants there, and decided to work on redesign of this type of reactor plant. Four small 12 MWe LWGR plants were built at Magadan, being labeled as the Bilibinol station, in 1974 but apparently these fall outside the commercial plant development. The RBMK-1000 was said to have been the product of years' worth of testing and development when the first unit of this class was brought on line in 1974 at the Leningrad Nuclear Power Plant. 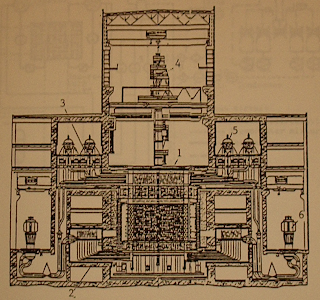 This marked the beginning of the RBMK era for channel type reactors; all thereafter were built to this design, except the very late RBMK-1500. The RBMK-2400 was designed and discussed but never built. The main production RBMK plants did not superheat steam in the core, but the newly designed RBMK-1500 and 2400 plants were designed for superheat, apparently. So there we have a very brief technical background of A to B to C for the Chernobyl station's RBMK-1000 plants, and a few of the incentives to develop such plants. People who are interested in our previous posts should use the Google search box on the blog and find our previous entries; this is a good tool to use for any topic on this site. You'll see some coverage in the press of an anti-nuclear protest in Austria. Austria? That's right! A country with no nuclear power plants. Well, no OPERATING nuclear power plants. Austria almost had one; the Tullnerfeld generating station, which was a Kraftwerk Union BWR (2100 MWt / 692 MWe) whose construction began in 1972 but which was never started up. A public vote cancelled its operation in 1978. Austria amended its constitution to ban all nuclear power plant construction back in 1999. So why are we concerned with this protest rally -- which only had 2000 attendees? Even the much-ballyhooed Tokyo rally doubled this in number, and those people are a lot closer to the action, as it were. TEPCO has shown a map of the rad levels on site. The discovery of a general 300 mSv area (30 R/hr) has been noted and our previously reported finding of a piece of debris reading 900 mSv (90 R/hr) has been repeated. This helps explain why TEPCO is now working so hard on using the remote controlled vehicles to clear the debris from the area of the reactor buildings. Going now to the water problem, TEPCO now sees a rising water level in the No. 3 and No. 4 plant turbine buildings... and this water is now much more highly contaminated than it was one week ago. There doesn't seem to be much use in speculating where the water in each building is coming from; it may be one water mass, essentially, through fissures and voids in the ground / concrete / foundations and there could be water from all the plants in communication. The same tired line is obvious; TEPCO needs to re-establish some sort of recirculating cooling ASAP. At least as of this time repeating this line we can also say that TEPCO clearly knows this and has already ordered equipment (the heat exchangers) to make it happen. In the meanwhile TEPCO tries to stay ahead of the water storage problem by buying and shipping in storage. 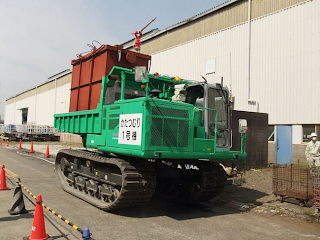 Tanks are being placed on site, and so far as we know work on the mega-float continues.. this particular tank having arrived April 7th at Yokohama for modification for this operation. Here are some interesting TEPCO press photos. First, a Komatsu PC200 excavator with claw attachment in place of the normal bucket. 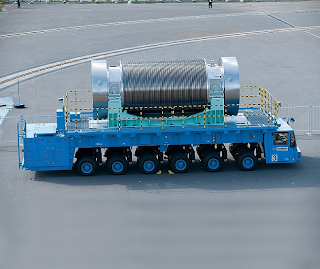 The arm of this machine has the number 2.9t on it which we assume means lift capacity of 2.9 metric tons. In the background is the lead-shielded mobile operating center for the remotely controlled equipment such as the Komatsu. And we also have a look inside the control area for remote controlled equipment. We aren't sure if this is the inside of the mobile vehicle or not, but it might be. Again, this is a TEPCO press photo. As we find ourselves, incredibly, at the 25 year anniversary of the accident at Chernobyl, we read that Dmitri Medvedev has been quoted in the press as saying that the Chernobyl accident taught us that we need transparency in the operation of nuclear power plants. Or something to that effect. 1. Very large, loosely coupled reactor cores can be very dangerously unstable. 2. Safety interlocks and protections should never be overridden. 3. Proper containment for all DBA's must be provided for any plant of any size. 4. Operating entities must never allow test procedure deadlines to subvert a conscious sense of safety-mindedness and questioning attitude. 5. No graphite moderated reactors should be built or operated ever again. The release from the Chernobyl accident in 1986 and the Windscale accident in Great Britain in 1957 are the two highest in history, and both were from graphite moderated reactors of large size. As readers here know the only RBMK-1000 plants still operating are inside the Russian Federation. We could come up with some further things, but we'll stop here to make this tie-in: You'll notice that NONE of these correlates to events at Fukushima Daiichi. As a matter of fact, they don't correlate to TMI either, and TMI doesn't correlate to Fukushima Daiichi either. This just further points out the irrelevance of all the comparisons being made in the general press as we witness the ongoing situation in Japan and simultaenously arrive at this quarter-century mark for the Chernobyl accident. More on Chernobyl background to follow this evening. Primary plant temperatures continue to remain well in control at plants No. 1 through 3, even if there is little or no flow through the cores yet. Problems at No. 4 plant continue, with the sustained need for large amounts of water injection into the spent fuel pool, while TEPCO tries to figure out how to reinforce the building so that the fuel pool's mass does not collapse the structure. TEPCO has made some further statements about the preventive measures taken to control radioactive contamination in the Pacific Ocean, and has released this informative picture you now see. Click to enlarge. Even the location and number of zeolite bags placed in the water is delineated. This is one of the more informative pictures TEPCO has released, of this type. 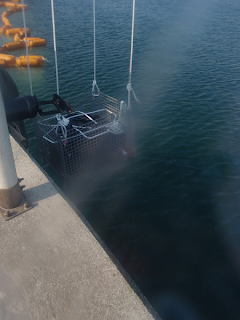 Below is an official TEPCO press photo of one of these Zeolite bags being lowered inside a cage, by crane, into the water right off the plant. Speaking of TEPCO press photos, here is another good one; this shows the water sampling chamber being lifted out of the spent fuel pool at No. 4 reactor plant. The concrete pumper truck was modified to be able to both drop in and retrieve this by cable, as well as provide television camera footage from the tip of the pump arm. This photo is from outside. The traveling crane is very much in evidence; it's green. TEPCO is now worried, because this spent fuel pool (containing some 1500+ fuel assemblies) seems to continue to heat up, so that the effort to use very minimal water in the pool to control its weight is not working out in the grand scheme of things. We hope to get some more, and better, details about what's going on at the site this evening and overnight since the weekend is over in Japan. Temperatures and pressures in the three reactor plants suffering accidents at Fukushima Daiichi remain steady, even slightly lowering. This is a good sign - having had this condition last this many days. However, there are now multiple reports that NISA is questioning the quake resistance of the reactor buildings at Fukushima Daiichi if the dry wells are filled to the level of active fuel. This would be a considerable mass of water; we haven't seen any figures quoted yet, but that much mass that high up in reactor buildings already very seriously damaged is surely something worth thinking about. TEPCO is clearly thinking about getting the still possibly semi-molten fuel masses covered in the reactors, and with the known leakage in the recirc pump loops the only way to get water level inside the pressure vessel above the level of the inlets of the jet pumps is to raise the level OUTSIDE the pressure vessel above them. Yes, there will be some contact cooling at the lowest radii of the lower pressure vessel head and maybe some along the pressure vessel barrel itself but the primary goal is to raise water level INSIDE the pressure vessel, all the way through and not just in the outer annulus. As we mentioned before, there is probably no direct flow through the cores at all if only the normal feed lines are in use; TEPCO either needs to send water through the spray nozzles / spargers or else fill the dry wells; it's that simple. This presents a very ugly catch 22 situation. Further, there are structural integrity questions now about the spent fuel pool in No. 4 plant, already mentioned on this blog, and so we find the situation now that in order to do what it must -- cool the reactor cores, and cool the spent fuel pool in No. 4 plant -- TEPCO must risk structural failure in one building and seriously reduced earthquake resistance due to higher level, or altitude if you will, water mass in the others. Perhaps the biggest news of the day is the discovery on-site of a chunk of building material that is reading 90 R/Hr. This is a pretty hot piece of building material; it's been taken away and stored. One wonders just how this chunk got this hot .. where did the contamination come from, and where inside the reactor buildings will they find the area where it used to be? Will that area be just as bad, as a whole zone or rad field? This piece was found by No. 3 reactor building. Surely TEPCO will try to quickly analyze this thing to find out what's on/in it. More details as they come out.. but it's Saturday, and news is fairly quiet in Japan on weekends, it seems. Considering the number of articles being published world wide, the bailout on nuclear by Germany and Italy, the ongoing bad press TEPCO and the Japanese government are getting about Fukushima Daiichi and the fact that it's Earth Day 2011 I though we might take a little walk back in time to a period long enough after the last accident here in the United States that the immediate furor had settled; this was the partial core melt due to a stuck open relief valve and many, many human errors at the Three Mile Island Nuclear Generating Station, involving Unit No. 2. What I'm interested in is the public opinion at that time. 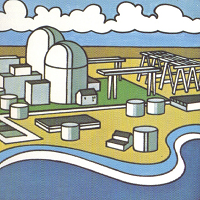 Below, an illustration of the Three Mile Island Nuclear Generating Station from a brochure printed by the owners of the plant (Metropolitan Edison, Jersey Central Power & Light, and Pennsylvania Electric Company - all subsidiary companies of General Public Utilities Corporation) before the plant was completed, and which is now in the APRA library. There might be no better volume to reference to take a brief look at what public sentiment was like a sensible period after the TMI accident than "Public Opinion and Nuclear Energy" by Stanley Nealey / Barbara Melber / William Rankin and published in 1983 by Lexington Books. This book, by the way, is one of a series of studies performed by the Battelle Human Affairs Research Center. The year 1983 is long enough after TMI that the immediate fear .. and fearmongering by the media .. had faded out so that people expressed opinions based on both their previous knowledge of nuclear energy and the things they'd taken the time to learn - rightly or wrongly - since that time. Few people can read of the events such as at TMI or Chernobyl or now Fukushima Daiichi and not want to know more about what happened, what could have been done and so forth; it's the quality of material they consult that determines how realistic their knowledge base becomes, and that's often (very highly) limited by the media. "Through mid-1981, however, the percentage of the public who supported the continued building of nuclear power plants in the United States was 5 percent to 10 percent more than the percentage of the public who opposed such construction." "Although public support for nuclear power has decreased as a result of the TMI accident, the public is not favorable to forgoing the nuclear option." And perhaps most relevant to what's going on worldwide right now, especially in Germany and Italy, also from this study's summary conclusions: "While a slight majority favors cutting back on operations until certain safety questions are answered, a majority is against prohibiting the construction of any more plants, and a large majority is against shutting down all nuclear plants forever." Clearly this is not overwhelming opposition to nuclear energy as we might have been led to believe. In fact, it's a continued support. But how is this possible given the still recent memory of the TMI accident? Here are some suppositions on my part which are also supported by data in this study. 1. No one got killed, or seriously hurt, or close, and neither did any animals. We don't need the BARC study to tell us this; this is actually a supportive point for nuclear energy, in that it's possible for a serious accident to occur with no direct casualties. 2. Much of the blame was not placed generally. On pages 86 and 87 of "Public Opinion and Nuclear Energy" we find that 55 percent of the public believed that human error was to blame for the accident (mostly the case, actually) and we find that the entities disliked for their handling of the accident were mostly the owning utility companies and the company who designed the plant (we must assume they mean the reactor vendor, Babcock & Wilcox.) We already know that Babcock & Wilcox's image was bruised inside and outside the industry. So what we see here with this point is that the public didn't go off half-cocked and start believing that all nuclear power plants were unsafe; the public instead knew who to blame, even if at that pre-internet time they had no technical detail to tell them how it happened or how to avoid it in the future. 3. People still felt the effects of the "energy crisis." The doom and gloom days of supposedly dwindling oil, and a lack of energy sources, were still in the minds of many (noting the Arag oil embargo six years before TMI) Few were willing to think about discarding a sizable source of energy in this country so easily. We can now see very easily that even in the period soon after TMI happened, the public was not in the majority against nuclear energy in principle (even though the study did state that there was 'majority opposition' to having a nuclear plant built near one's home, which is not surprising, really.) People were informed enough about the energy situation that they knew nuclear had to play a role, although interestingly the study pointed out the general lack of knowledge about nuclear energy and a serious misconception about the potential of solar energy far beyond any realistic capability at the time. Reports of the nuclear energy industry's demise at that time in today's press are thus incorrect, both from the standpoint of actual nuclear power plant operation and from the standpoint of public opinion. Perhaps the most important phrase in the entire Battelle-HARC study, not really relevant to TMI but relevant then and now generally is this one, speaking about persons "on the fence" or uncommitted one way or the other: "It does seem, however, that negative information, particularly involving emotional issues of safety and health (Three Mile Island, for example), is more likely to seize the attention of the uncommitted than is information supporting nuclear development." Truer words have never been written. The same could have been said for steam trains when they were new. And we knew this long ago here; this is why we have the tireless campaign mounted and continuing against fear-mongering and misrepresentation in the press at large. Opinion now about nuclear energy is only just forming, nation-wide, in the USA. In some places, it's become very polarized, such as in Vermont; in other places, early attempts to stir the public into a frenzy (northern Ohio) by politicians have failed spectacularly and rightly. As the details about Fukushima Daiichi emerge over the weeks and months, the fate of the embryonic Nuclear Renaissance we have been seeing in this country hangs in the balance, and it is likely on the quality of the reporting of details and failures and comparisons to US plants that the renaissance's fate depends. Nuclear power plants are not places where trench-coated TV reporters can barge in with a camera running to look for dirty dishes, but the public will be waiting to see how the nuclear energy establishment responds to their concerns about plants both old and new, and ordered, and projected. Hopefully the establishment knows the things we now do after having looked at this fine Battelle-HARC report and is ready to oblige the public. Plant data from Fukushima Daiichi remains fairly constant, with the reactor plants showing continued slow cooling. In fact, it's been released that the latest NRC consideration of the situation is that it is "stable, but fragile." This of course refers to both the potential for either loss of cooling to the cores, or else further possibly sudden release of contamination to the environment, which most likely would be a release of contaminated water. TEPCO continues to pump water out of No. 2 plant, as reported everywhere, and intends to double pumping capacity within about a week. As Earth Day 2011 progresses, we also find in the headlines in Japan the stories that the remaining reactor plants at Kashiwazaki Kariwa, the largest nuclear generating station in the world, will not be allowed to restart until the Fukushima situation is resolved (being stopped apparently by local government) and we also see the hint that Fukushima Daini will not be allowed to restart until certain safety guarantees are made (this stoppage by the prefecture's governor.) TEPCO certainly has its hands full, and will be very short of power come the summer if all of these reactor plants are kept shut down. Having said that, it is of course imperative, given Fukushima Daini's closeness to the now highly-active earthquake zone off the northeast coast, that TEPCO perform major modifications to the plants at that site and improve tsunami protection before those plants can be allowed to restart. The case against idle reactors at Kashiwazaki Kariwa, where some reactors have never shut down (there are seven on site) is much less easy to make considering that it's on the opposite coast. 1. In 1979, backup safety systems were separated. This means that backup systems like diesel generators were made fully and totally independent in all aspects. This might include ensuring completely separate water cooling for the diesels, it might include totally separate buses the diesels power, and even separated locations. What this step did was eliminate the chances that a problem in one backup safety system could have a negative effect on the operability of another. 2. In 1980, control rooms were reconfigured to improve operability and analysis of information by plant operators. 4. In 1988, more batteries were added at all stations to protect against SBO or Station Blackout. As readers here now know, longer battery life delays core damage if there are no sources of AC or DC available either offsite or from EDG power. 6. In 2002, plants added another spare portable diesel generator and water pump. The need for this is obvious, given the events at Fukushima Daiichi. These have been present at US plants now for a number of years. We can see then that there are many things that might be considered superior points in the construction and operation of US BWR plants as compared to those at Fukushima Daiichi, and in fact these are just a few of the differences. The nuclear power establishment in this country has learned from past accidents and incidents, and many many reactor-years of operation in a number of programs. We need to all keep this in mind as Earth Day 2011 progresses, and the environmental voices begin to rise in volume. Just six months ago, nuclear energy was one of the darlings of the green movement and environmentalists and climatologists in many places the world over. We must thus also remember that what's happening in Japan is the 'worst case' scenario, in which a major natural disaster overwhelms all active and passive core safety protections. Knowing the differences here in the USA compared with Japan, we can.. and should.. rest very comfortably at night. Labels: " fukushima daiichi", "BWR", "earth day", "mark I"
Reported fairly widely right now is the fact that the Italian government has decided not to pursue further plans for nuclear power plants, one government representative according to AFP reports saying that the plants "are not culturally acceptable at this time." Now, it isn't like this is a huge train wreck. Italy already bailed out on nuclear power a generation ago... it shut down all its nuclear plants in a pointless act of self-immolation after the Chernobyl accident in 1986. What Italy is cancelling is the beginning of a plan they'd made to return to having some energy generated by nuclear energy. The only recent action topping these in total irrelevance is the action of AREVA, of France, who made a big "dog and pony show" of sending their CEO to Japan, amid many flashing bulbs and cameras, who then came away with building only a water treatment plant that anyone could have built. How is it that one of the self-described world wide leaders in nuclear power engineering comes away with less than a bid to defuel the reactors, or at least participate? Well, it probably makes sense, since the French don't have one single boiling water reactor anyway. Contaminated water is contaminated water; they can handle that. South Carolina Electric & Gas / Santee Cooper's plan to build two Westinghouse AP1000 plants at the existing Virgil C. Summer Nuclear Station in Jenkinsville, South Carolina moves along with today's news that the NRC has completed, satisfactorily, the Final Environmental Impact Statement for this project. There are only a few more hurdles, including the final RPA or safety analysis as well as some review of changes Westinghouse made to the certified AP1000 design in the interim period, which should both be no problem. Virgil C. Summer Nuclear Station has on site one Westinghouse three-loop PWR plant, rated 2900 MWt / 966 MWe and which entered commercial operation in January 1984. Labels: "AP1000", "virgil c summer", "westinghouse"
We've been waiting for a LONG time now to see some actual technical details emerge about just what kinds of systems the plants at Fukushima Daiichi had available for decay heat removal after the total loss of power (SBO) when the tsunami hit. It should be remembered that these plants don't have to subscribe to NRC rules that have for a number of years now covered plant modifications to mitigate SBO sequences leading to accidents; as a result, the systems installed at Fukushima Daiichi cannot be expected to be identical to any US plants of similar vintage. In fact, most US plants of nearly identical vintage differ between themselves in some respects, except of course for the mandated backfits dictated by the NRC. The following chains of events include known facts, and interpretations. It's still too early to have all the information, but we can start to try to figure out some actual events that occurred in the first few days. With that in mind, we now have available a message from the Japan Nuclear Technology Institute that gives us a couple of mechanical hints. This letter, available at the JANTI site is really intended to be a stern admonishment to the senior nuclear establishment in Japan (primarily the NSC) to get on-site and get contributing. Anyway, the letter mentions the fact that No. 1 plant was using an isolation condenser system for decay heat removal, and that this system functioned for half a day before not being operable any further, and also indirectly states that this is longer than it was designed to operate for. This is a very old system for removal of decay heat when the core is still pressurized, and requires only DC power for valve operation in the short term, although according to a report we have here by Brookhaven National Laboratories the isolation condenser makeup system must be operable within about an hour to maintain water level. This same report implies that, and we're making an assumption here, if the plant is in its original configuration AND that configuration matches most plants of that overall design then the only other source for injection at high pressures is the FWCI or Feedwater Coolant Injection System that requires AC power. Loss of DC power will remove operability of the isolation condenser system as well. Decay heat removal at high pressure is thus limited in several ways if AC power is lost. We might then assume that the isolation condenser system did its job at least temporarily; the JANTI letter seems to imply that the system functioned for 12 hours ("half a day.") We might guess that this would roughly correlate to battery power, so we looked for any relevant data we could find about how long they might last in this condition.. not knowing the actual capacity of this plant's batteries. A study performed covering the Browns Ferry plant by Oak Ridge National Laboratories indicates, for that plant, a battery life of about six or seven hours. That time.. six or seven hours.. roughly correlates to the increase in CV pressure, so that we might wonder if the operators, knowing loss of the isolation condenser system was approaching might have depressurized the plant deliberately to allow LPCI. We will have to wait until an official narrative appears. Now, we turn to No. 2 and No. 3 plants, which are of a newer design. The JANTI letter indicates that these plants were using steam turbine driven coolant injection systems; these functioned for 3 days at Unit 2 and for 1.5 days at Unit 3. The available graphs don't give good data for pressure vessel pressures for these two plants early on; what we can say is that No. 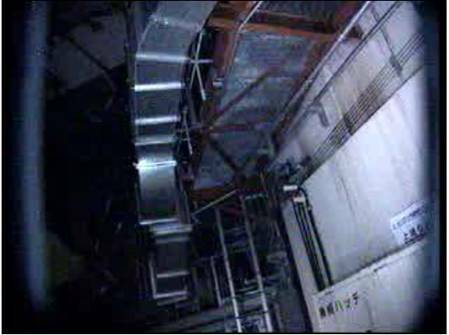 3 plant started venting its containment at 20:41 on the 12th, which is BEFORE it reported a loss of cooling function. That occurred at about 5 AM on the 13th. At No. 2 plant, venting of the containment also started before the report of loss of cooling function; No. 2 started venting at 11 AM on the 13th, with the loss of cooling report coming at 13:25. One has to guess that operation of the RCIC system, which is what we assume the letter to indicate was in use, eventually failed due to either loss of all water supply, or loss of battery power. By early afternoon on the 13th No. 3 was receiving seawater injection from external sources, and No. 2 followed a little over 24 hours later. SO, NOW that we've been through all that, what do we glean? -Battery failure is probably the next aggravating event in the fault tree after loss of all AC power, at least at No. 1 plant. -It appears that the emergency cooling systems functioned longer than the owners / operators and nuclear establishment in Japan had predicted they would. Again.. we don't have a good handle on what the present battery capacity on the plants at Fukushima Daiichi is. We suspect at least on No. 2 and No. 3, looking at the events, that it's considerably longer than at No. 1. That will be a major factor in examining the sequence of events, in a causative way. What we're trying to do here is take the few new facts we've been given, and start down the path to understanding those critical 24 to 48 hours in which the whole situation at Fukushima Daiichi turned from unusual event to accident. We will provide updates and corrections to the information as new data appear. NRG Energy has pulled out of the project to add two more reactor plants to the South Texas Project. TEPCO had been an investor in this project, and surely their hands are completely full .. and in fact the company may have to be either assisted by the government (either directly with funds, or else by way of easing the process for TEPCO to get loans) or else taken over by it. That means that there's no money coming there, and now that NRG has pulled out that kills the deal. Two Westinghouse PWR plants operate at the South Texas Project site. AREVA, of France, has been awarded the first post-accident contract at Fukushima Daiichi. This company will construct on-site a large water treatment plant which will filter and decontaminate the large volume of contaminated water on-site (now totalling some 67,000 tons at last estimate and growing daily.) The announcement was made Tuesday in Tokyo, by TEPCO officials. We're still waiting for a nod to one or the other groups of reactor vendors and their consultant firms to see which gets the contract to decommission the plants. Both are very viable candidates. If AREVA has thrown its hat in this ring, we're not aware of it. As mentioned here, TEPCO has begun pumping the radioactively contaminated water from No. 2 plant over to the site radwaste building, which is south of the reactor buildings. This is being done through temporarily installed hoses, and pumps. We all knew this was coming... and what it entails. Let's look at the headlines used to relay the fact that the operation had started. NHK NEWS JAPAN: "TRANSFER BEGINS OF HIGHLY CONTAMINATED WATER." ASSOCIATED PRESS, USA: "NUKE PLANT STARTS PUMPING OUT RADIOACTIVE WATER." Thanks to Fintan Dunne, we're now on to how this actually works. Note the key term "nuke" in that headline; we all still associate that term with nuclear weapons, so they'll use it every time they can. The 'pumping out radioactive water' part is surely meant to imply that they're just spewing radioactive water all over the place, in the ocean, the sky, everywhere and you're sure to be alarmed enough to read the story because of the key words and deliberate phrasing. Which has nothing to do with journalism. But that's OK: true journalism in this country has been dead for many decades. Even so, keeping that lowered standard in mind, I still think whoever wrote that AP headline is the idiot of the day. I'd like for all our regular readers here to keep an eye out for this kind of trick.. this kind of implication.. and make sure to either have a laugh at it when you see it or else leave a comment wherever you do see it. It would be great if we could get them to report facts without slant. They won't... because they don't know how.. but it would be nice. Note: When we say 'true journalism is dead' we mean EXCEPT for Fintan Dunne. The long-time readers of this blog might recall last year's various comments on the entire Vermont Yankee situation vis a vis licensing rights that the state of Vermont has, which no other state has. Here is one example. Now, it looks as if the license extension is contentious on a whole new level as Entergy is suing the state as of Monday. This has all been going on, as you now see, for years... and it looks like there's more than just nuclear safety going on here since Entergy claims that the government offered some sort of deal to allow the license extension if Entergy would offer price cuts to Vermont customers. The situation in Vermont regarding the plant has always been messy since the Vermont state legislature inserted itself in the process. It has gotten worse since a number of mistakes were made by Entergy ... particularly regarding the tritium situation in the groundwater. We'll keep an eye on this to see how it turns out. Whatever the case, it might start a precedent against other plants of similar type and vintage. NISA has announced that TEPCO is now actually pumping the highly contaminated water from No. 2 plant's turbine building to the radwaste building onsite. TEPCO has ensured the watertightness of the facility, and NISA has signed off on the procedure, facilities and hardware as well as precautions. The transfer of all the water may take weeks. No. 1 plant's primary containment pressure is actually dropping now, which is a good sign. As far as we know, nitrogen injection still continues. Water injection to all three reactor cores was temporarily stopped during the day on Monday to replace the hoses, and was restored thereafter with no problems reported. There have been so many comments, and e-mails about the Soviet-designed RBMK-1000 channel type, graphite-moderated BWR plants inquiring as to which were still operating that rather than answer them all individually, I'll try to cover this with a post. Firstly, let's look at the Chernobyl site. Unit 4 was the unit that experienced the accident; the other three plants at the site were eventually shut down, but over a number of years. 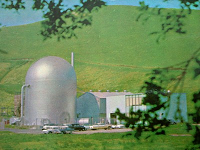 The original plans for this site called for six reactors to be in service by 1990, and in fact both No. 5 and No. 6 were under construction at the time of the accident but were never finished (although No. 5 nearly was at the time of the accident.) So none are left there. The two units that ended up in Lithuania are shut down permanently. Our information here shows that these were actually RBMK-1500 plants, although other sources indicate that the net output of these plants was 1185 MWe, not the 1500 MWe of a full RBMK-1500 plant. It may be that the plants had smaller turbines than originally planned for the larger core size of the RBMK-1500 (which was 4800 MWt instead of the 3200 MWt of the RBMK-1000.) Whatever the case, these are shut down. The site, by the way, was originally planned to have four RBMK-1500 units in total operating by 1990. In the Russian Federation we find all the operable RBMK type reactors, and they are all RBMK-1000 types. None of the proposed RBMK-1500 or RBMK-2400 units were begun. 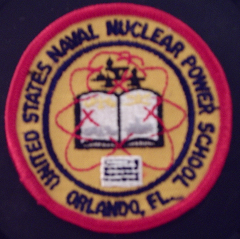 None of the few predecessor channel-type reactors remains in service either. Kursk Power Station has four RBMK-1000 plants in operation. A fifth under construction was suspended. Leningrad Power Station has four RBMK-1000 plants in operation. Smolensk Power Station has three RBMK-1000 plants in operation. A fourth under construction was suspended. Eleven RBMK-1000 plants are in operation as of now. Four RBMK-1000 and two RBMK-1500 plants have been shut down permanently. Four RBMK-1000 plants that were under construction were suspended and cancelled. Two RBMK-1500 units that were planned appear never to have been started. No RBMK-2400 plant was ever built or ordered. Sources: WNA Database, and "Soviet Nuclear Power Plants" / David Katsman / Delphic Associates 1986 - from APRA technical library. The report states the reactor plants were being cooled by natural circulation on the primary side, and aux feed and steam venting on the secondary side. These are three-loop Westinghouse Pressurized Water Reactors. More details to come.... the situation appears stable and non-emergent. UPDATE, 3:00 PM: PRESS RELEASE by Dominion indicates offsite power available and the situation is stable at both plants. The plant status at Fukushima Daiichi is, at the moment, quite stable... and it's refreshing to note that there have been no sharp changes in plant status or remotely indicated figures in quite a few days. Readers might, given this, wonder why I'm making a post. I have two points to make. 1. The rad levels discovered by the robots inside the reactor buildings are NOT surprising, contrary to some press reports, given the condition of the reactors. Much higher levels have been encountered in previous accidents. 2. Many, many press outlets are already using the term "sarcophagus" for the enclosures planned by TEPCO. Readers here know better. There will be two phases of enclosure; first, a fabric type enclosure on steel framing that will prevent aerial release of contamination, and later a concrete and steel building surrounding the original (damaged) reactor buildings. This second enclosure will provide weather protection to workers dismantling the plants, and prevent any further spread of contamination. It is important to note that the press is trying to imply - wrongly - that TEPCO intends to permanently surround / bury the plants and leave them alone. This could not be more incorrect. Two groups of firms - one comprised of Toshiba, Westinghouse, Babcock & Wilcox, and The Shaw Group, and the other comprised of Hitachi, General Electric, and Bechtel, have offered competing plans to not only defuel the reactors but have the site cleared .. that means plants demolished .. in ten to fifteen years. It's imporant to understand the difference between temporarily placing a plant in a storage status, which here in the US by NRC terms is called "SAFSTOR" and leaving a plant to decay permanently as it seems Chernobyl-4 will. The Fukushima Daiichi site will eventually be cleared of the plants and associated equipment, at least above ground. It appears that TWO incarnations of building coverings are planned; one for the "Step 2" phase of the plan which is around 3-6 months after "Step 1" is completed (and that should take 3 months) which will be a simpler type with air filtration to trap released particles. This may be the fabric type covering mentioned a few times before. In the plans for Step 2 though is the remark that detailed plans for a "full-fledged measure" of new external containment, with concrete walls and roof, should be completed at that time. So it looks as if there will first be a lighter enclosure of some kind, followed later by a heavy one which is the one that the defueling will eventually take place in. On the right at the location of the red box we see the feedwater inlet nozzle, and the sparger ring that distributes it all around the circumference of the pressure vessel. 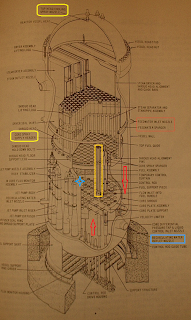 The red arrows show the normal flow for feedwater when the reactor is operating.. down around the outside of the core barrel, into the lower plenum, and then up through the reactor core. Now, in the situation we have here, water coming in here cannot be induced to go UP through the core because not only is there no flow path to be induced up and out but, as we now know, water is leaking out somewhere low.. probably from somewhere in one of the recirculating lines. Or multiple places. Look at the blue box showing the recirculating line outlet nozzle; if there is a leak in this system, the highest water level you can maintain in the pressure vessel is the height of the jet pump standpipes... look for the blue star. That's about 2/3 of the height of the active fuel region when the fuel is intact... see the tall yellow rectangle showing one installed fuel element in the core. 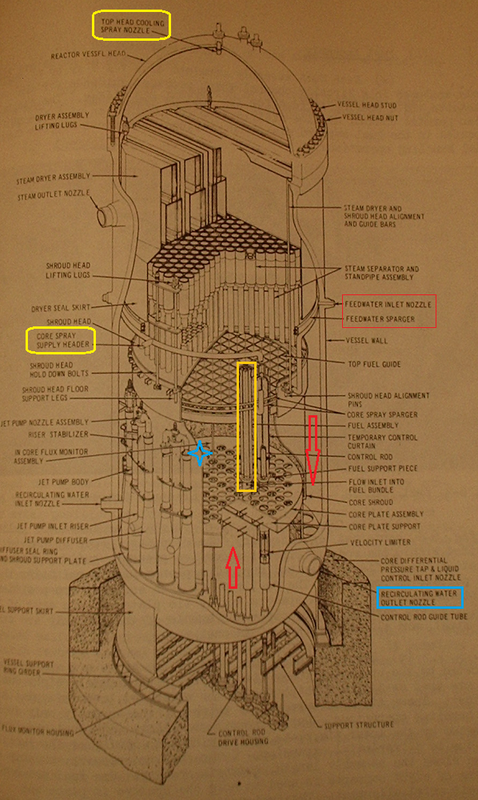 Thus, in order to get water flow THROUGH this region in this condition, you need water supply from above... see the other yellow boxes showing the location of two of the upper spray sources for the reactor core itself. It's important to note that it's believed that the reactor core material is still above the core plates. TEPCO's recent plan seems to confirm this, in as much as they're saying that they'll flood the PCV above the level of active fuel. That will also give some water contact to the lower head of the reactor vessel (although not a large amount, as readers here already know) and further improve heat transfer. It will also shield some radiation. Item: It appears, quite sensibly, that the jet pumps are not working. One might imagine early failure due to lack of reactor building component cooling water and particularly any time spent pumping salt water with core debris possibly mixed in. Thus, they cannot be counted on to force any water up through the core area. TEPCO was instructed by the government to produce this plan and while there are very many problems to be overcome, it seems that TEPCO does have a handle on all of the problems extant at the site right now and for the first time has let the world know just how aware of all the problems it really is. To those who read this blog regularly, the problems are all known but this plan is the first time TEPCO has itself stated all these problems and addressed fixes to them; let's hope they are aggressive with the implementation of this plan. The defueling plan for the reactors INCLUDES No. 5 and No. 6 reactors. This is, to our knowledge, the first official indication that these two remaining undamaged plants will be defueled. Since we already reported here a while back on the decommissioning of Nos. 1 through 4 and the cancellation of Nos. 7 and 8 the fate of the two remaining reactor plants was up in the air... and this seems to be the proof that TEPCO will give up any future hope of nuclear power generation on the Fukushima Daiichi site. We might add that the plan doesn't indicate if, or when, anything else will be done to No. 5 and No. 6 plants, including demolition. But I think we all know how this will end up. Labels: "fukushima daiichi", "no 5", "no 6"
---TEPCO holds elaborate press conference in Tokyo with many plans. Here are some of the most important technical details, briefly. TEPCO will enclose the reactor buildings, as stated with new concrete walls, and we would imagine that will include a roof. Fuel removal would then later take place inside these structures. No time for fuel removal has been established since this is a part of long term goals. TEPCO will fill the primary containment vessels with water. On No. 2 unit, integrity will need to be restored. This will assist with cooling. TEPCO will ensure that the reactor pressure vessels are filled above the level of the fuel rods. 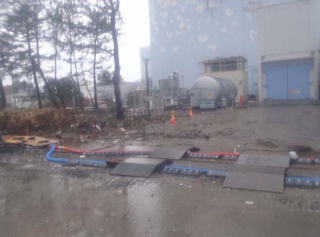 TEPCO will install external cooling systems (already mentioned on this blog) and there are a number of flowpaths under consideration at the moment. 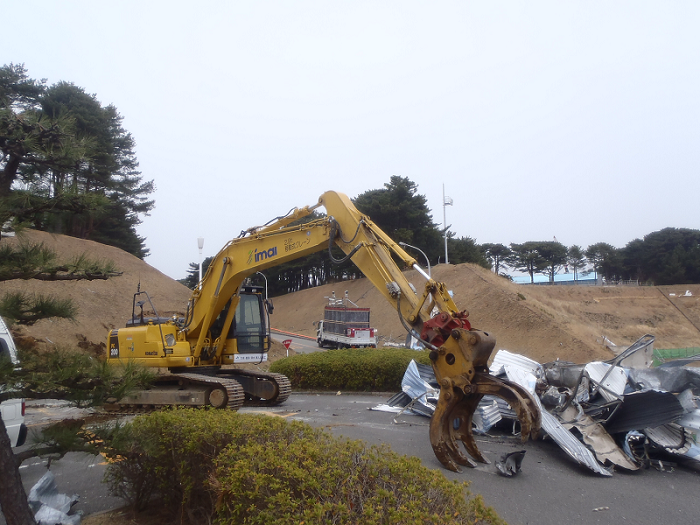 TEPCO will construct a permanent water treatment facility on site. TEPCO is not comfortable with structural strength of No. 4 reactor building below the spent fuel pool and will reinforce the building, or insert extra support, or both. These seem to be the most significant relative to reactor operation and fuel pool cooling. Many more items were covered concerning release of radioactivity and evacuation zones. I've just read the first concrete piece of evidence about how the new systems TEPCO is planning to install will work. Apparently, the idea is to obtain the feed for the pumps from, according to the article, "the reactor containment buildings." This still isn't clear, but it does seem to indicate that TEPCO acknowledges the leakage and intends to recycle water in a sort of non-sealed, but closed loop fashion for the primary cooling... the heat from which will be transferred to sea water. Right now, without any further information, it might be assumed that TEPCO will be taking the water directly from the dry wells or the suppression pools. Important to note is that the primary side of this system will become highly radioactively contaminated, so that the equipment will need to be shielded or else access controlled as the rad level around the equipment will be very high. Labels: "cooling", "fukushima daiichi", "TEPCO"
Unfortunately, your author suddenly became quite ill yesterday and hasn't been on his feet since. However, he's back vertical temporarily and here are the most important updates since the last post. TEPCO continues to try to stop any and all leakage of contaminated water into the ocean by the use of further plates outside the plant seawater inlet screens, and the use of zeolite in large bags to trap radioactive particles in the water. While the vast majority of the coverage on Japanese television stations and other media there is focusing now on the problems being suffered by the evacuees, there continues to be a major focus outside Japan on the effect that spread of radioactive contamination will have in the Pacific fishing business. This cannot be denied, but it shows the focus of those not living in the disaster area. The dewatering problem at the Fukushima Daiichi plants continues to slowly get more ponderous as water being deposited into the very complicated universe of buildings, pipe tunnel connections, drain pipes and drain sumps, various cracks in the outside and the substrate material continues to grow in volume; yet, it is necessary to clear the turbine buildings of this water in order to stop the supply. Apparently new reviews by NISA and TEPCO indicate that only half the theoretical maximum volume in the plant main condensers can now be used for water storage, since with the weight involved at a higher level they're not guaranteed safe in another earthquake. This loses TEPCO about 3750 tons of water storage capacity it would like to have used. Further work continues on-site but not right in the plants to clear the area of rubble using the aforementioned remotely-controlled construction equipment, and more spraying of polymer to fix the radioactive debris and dust to the ground has been accomplished. Electrical distribution gear for the core supply pumps at Fukushima Daiichi have been moved up to a nearby hill, as part of the overall action (being taken at every nuclear plant in Japan, to some extent, too) to prepare for any further earthquakes and tsunamis. Temperatures at No. 1 plant continue to lower, while pressures remain steady. None of the plants is rising in temperature or pressure at this time. The most interesting news of the day is the still developing story that TEPCO has ordered a large number of special heat exchangers, planned for a new external cooling system that it will construct for each reactor plant. This is a novel approach, and probably the best idea TEPCO has had yet. According to the Kyodo story, TEPCO will use several heat exchangers for each plant, and will connect them to the existing external emergency connections that it's been using prior to this for core injection. Apparently TEPCO will use electric pumps, and two core connections to establish recirculating cooling flow and then use hoses to bring in and return seawater, if we understand the plan correctly. No timeline is given on this plan -- but given the mounting complications of the water in the buildings and in the ground, I would have to say that this plan should be given top priority. JAIF has posted its 10:00 AM (Tokyo time) update of general data and plant condition and according to the feed nozzle temperature readings, all three plants are actually at the moment very slowly cooling down (looking at about the last 24 hours) now, so it must be that there was an error, or a temporary spike. It's difficult to say just what the condition of any part of the I&C equipment actually is at this point, given the environment it's being asked to work in. However, given what little data we have it seems temperature is under control. And, to catch up on a previous trend.. Primary containment pressure at No. 1 plant has certainly stabilized, so that either there's a leak in the containment (although probably not a large one) or else whatever TEPCO is using to inject nitrogen is pumping at shutoff head and they don't know it... but we bet on the former. As apparently does NISA. TEPCO is indicating that it might not be prepared to properly store the highly contaminated water at No. 2 plant in new tanks until perhaps the end of May. (That's for 27,000 tons.) This statement reveals that TEPCO is planning on using only the new, special-purpose tank volume for this most highly contaminated water.. and isn't planning, it would seem, on using the giant barge for this purpose. We are looking for status updates on this "mega barge," as well as a go / no-go on the Russian floating water treatment facility mentioned hotly for a day or two some time back. It seems as if TEPCO might have discovered what happened when the company essentially plugged up the Eastern facing, or downhill, end of the probably highly fractured facility grounds, pavement, substrate and foundations because there has been a spike over the last day and a half in activity in sub drain pits which seems to correlate to water that's been through one of the reactors. We wondered before if this weren't really the fix it seemed.. the public was very relieved that the spread into the water was cut down, but we were very interested to find out where this water would appear next given the essentially fixed flow rate into the reactors. We are keeping an eye open for further official JAIF, NISA or TEPCO information about temperatures at the plants and will update again when something concrete becomes available. We've just seen a spokesman for a high-level group convened to consult TEPCO in plans of action at Fukushima Daiichi make a comment that might be misconstrued, or else is poorly translated: The quote essentially was that the damaged cores have dropped to the bottom of the pressure vessels in the Fukushima Daiichi plants. This is probably both a gross oversimplification, and incorrect. At the moment, it is a practical certainty that the reactor cores are still entirely within the reactor pressure vessels. Upper portions of the fuel are surely demolished, along with the upper parts of the control rod blades (whose melt temperature is below that of the fuel rods.) Surely portions of this demolished core material, some of it melted and fused together into what we call "corium," have dropped to the bottom of the normal core area, onto the core support plate. More than this is not certain, and would be hard to ascertain without better data than we have right now. It seems likely that cooling was maintained longer in No. 2 and No. 3, so that if any of the plants were likely to have experienced a core support plate failure -- meaning the core physically can drop to the bottom of the pressure vessel as the official is quoted as saying -- it would be No. 1 plant. However, there is no SOLID evidence of melt-related failure of any of the low penetrations or of the lower head. Cooling water is getting out of the pressure vessels, and the location of this is not known exactly and frankly might be multiple locations. Salt buildup inside the reactor pressure vessels, and probably any and every pipe used to carry seawater during the time that seawater was all that was available (after having exhausted all feed water, condensate water, all fresh water stored in condensate surge tanks, and borated water SSD tanks) is now salted up to some degree. One estimate guessed that there might be as much as 25 tons of salt "cooked out" inside No. 1 reactor's pressure vessel and close-in piping. Surely some, or much of each core is encased in salt of some thickness. The spike in radiation after the recent aftershock may have been the result of further sudden physical derangement of one of the reactor cores. Beyond this any specific details of actual core conditions are a very risky thing to attempt to assess with certainty. Frankly, any further than this is really quite irrelevant at the moment since the real focus is on getting cooling water flow through the pressure vessels. The melted and deranged core elements will surely hinder water flow and cooling, leading to a random array of hot spots, and difficulty in eventual removal of the fuel. But for now, at least at far as the actual core conditions beyond what we've just described and the oft-repeated TEPCO estimates of percent fuel damage there isn't much more that could be said with any credence. There are a number of other plants which are scheduled for complete decommissioning. EnergySolutions has set up a subsidiary company to decommission the Zion nuclear station, called ZionSolutions. -Some plants are not immediately deconstructed (DECON) but rather might be placed in a defueled, stored condition for a period of time (SAFSTOR) to allow decay of radioactive material before a near term disassembly is planned, or else plants may be entombed (ENTOMB) with concrete or other materials for long-term decay of radioactive material. Examples of all of these exist in the United States. -In a number of places where the nuclear plants have been removed, or else are shut down and defueled awaiting deconstruction, the spent fuel is transferred to an ISFSI or Independent Spent Fuel Storage Installation. This removes the need for continued operation of spent fuel facilities in the original nuclear plant and allows decommissioning and demolition to proceed. The prospects for the eventual DECON status of the Fukushima Daiichi plants seem assured, even if a firm timeline is not known or else seems questionable in some respects. Experience from other accidents has led to better procedures and specialized equipment. For example, the damaged fuel at the TMI-2 plant was damaged in 1979 but not removed from the reactor until 1990, but Toshiba and a number of other partner companies in the field of nuclear energy / nuclear engineering are offering to have the site cleared (even if not fully released) in ten years. CLICK HERE to see the NRC page on US sites undergoing decommissioning. Most of the recovered volume in the No. 2 plant pipe tunnel outside has been refilled by more contaminated water. NISA remarks that the water might be coming from the turbine building; that was our speculation, and probably everyone else's, a long time ago. There are also increases in activity in groundwater measurements. Even if we discount the first piece of information as spurious instrument reading, the second two are troublesome. Clearly (and we're saying the same things over and over again) TEPCO needs to get recirculating cooling operating, and to do this TEPCO needs to get access to the auxiliaries and equipment in No. 2 plant. This means the contaminated water in the turbine building has to be removed. It seems a number of tanks and a tank truck have been ordered from the US and one might wonder if there needs to be a rapid response to the problems at No. 2 plant that's a bit more aggressive than waiting for the chance to pump this water to an ideal location. Good enough might have to do for now. Some further details about the decom plan offered by Toshiba have come out, and they're pretty much as one would expect. The time span offered to site clear is still about ten years. These situations are all developing and details emerging, so we'll return with new information as necessary. Labels: "fukushima daiichi", "NISA", "TEPCO", "Toshiba"
Thank you to all our regular readers and all our new ones for setting a new one day discrete hit counter record, for the Blogger calendar day April 12th. I appreciate your visits and your comments and questions very much. Very little new to report from Fukushima Daiichi at the moment; water transfer procedures continue, while the rest of the temporary silt screens have been mounted across the seawater inlet gates inside the breakwater. Note: These will have to be removed once the seawater pumps are ready to be placed back in service. It is very interesting, and heartening, to see the relatively calm worldwide response to the NISA decision to self-raise the INES level at Fukushima Daiichi to Level 7... except in the United States, that is. Most organizations and most nations are responding with calm, and level-headedness. Of course the status up there at "Level 7" was previously only occupied by the Chernobyl-4 accident in 1986 and one wonders, given the admission by everyone who has looked at data that Fukushima Daiichi has in total released about 1/10 the radioisotopic material that Chernobyl did, how it's possible that three concurrent reactor accidents all with core damage and four spent fuel storage facility incidents/accidents with at least one guaranteed fuel damage event (that at No. 4 was as we noted confirmed, but we all already knew it) could have a LOWER total release than an accident at one reactor. If we take the consideration of "source term," used by many AEC / NRC calculations for plant siting and accident evacuation area which is based on total megawatt capacity, it would seem that the Fukushima Daiichi situation would HAVE to be worse, correct? No. Not even close. Two reasons: Steam explosion in the core, and lack of containment. These refer to Chernobyl-4. The details are so widely available on the accident scenario that we are obligated either to give the briefest of accounts or else go into detail never before seen; since the real 'front page story' is Fukushima, we'll select the brief version. Chernobyl-4 was destroyed by a reactivity addition accident; the core was placed in a condition, from a core physics standpoint, in which it was extremely unstable .. and it was done deliberately so that the operators could complete a required test. (A recirc pump flow coastdown test..) A test that would tend to increase the power rating in a manner of behavior that many Soviet operators may not even have been aware of. When the test was initiated, power rose instantly in the core, which caused the core to increase the amount of steam void. The reactor became autocatalytic, and the resultant rapid increase in heat caused a steam explosion. (There was likely a water slug effect, like that at SL-1, which increased the destructive effect of the power burst and steam expansion.) When the top covering of the reactor was literally blown right away, and all the coolant escaped, the super-hot graphite moderator, now exposed to air, began to burn fiercely. The massive release of radioactive contamination began. Now, we're not here to go into a huge amount of technical detail on Chernobyl, or for that matter the particular model of reactor that was destroyed there (which is known as the RBMK-1000 reactor.) But we can show you the second aspect mentioned: Containment. Look back at many previous articles on this blog to study containment and you'll see (as will our regular readers) how different the illustrations I'm about to show you .. from the APRA files .. really are. First up is an end view of the reactor complex, cut right through the reactor itself. 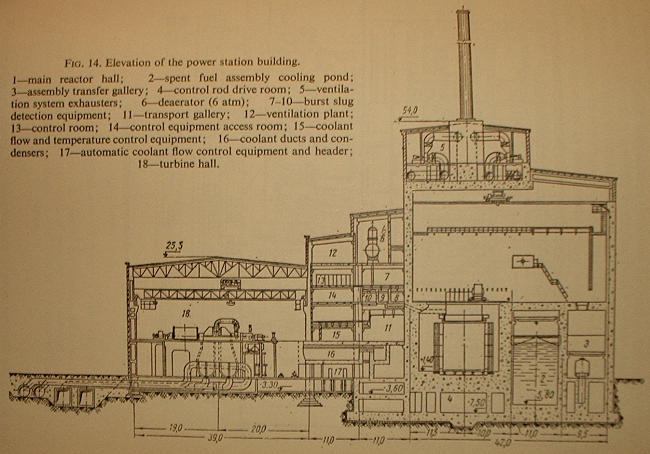 The reactor is at the center of the drawing. 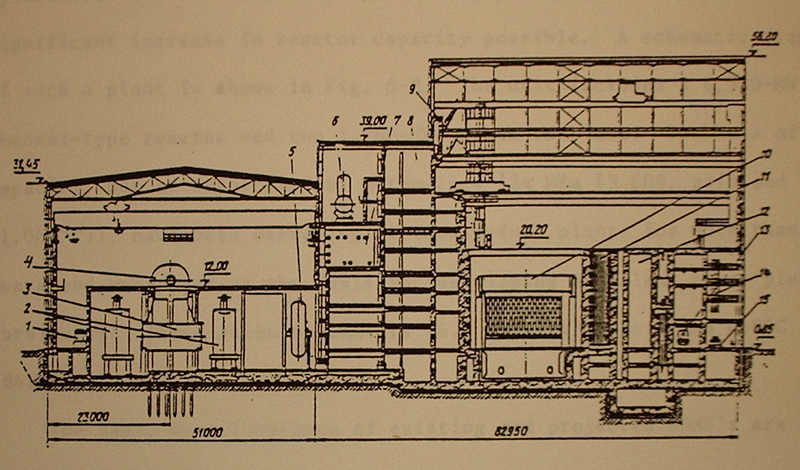 This reactor contains 1693 fuel channels, mounted in a giant cylinder constructed of graphite moderating blocks. And giant this reactor core is; the core diameter is 464.6 inches, while the core height is 275.6 inches. Immediately obvious is the fact that there is NO pressure vessel. The core is sitting in a concrete chamber which measures 70.87 feet on the sides and is 83.66 feet deep. Below the reactor, many hundreds of water inlet pipes feed water to the vertical channels where it's heated until boiling. This mixture exits the top of the reactor through many steam/water pipes and enters the moisture separator drums marked "5" on the drawing. (Note: Those of you familiar with the old GE BWR/1 plants, specifically Dresden-1 and Big Rock Point will recognize these external style steam drum separators.. and they're sort of distant cousins of the early steam generator designs manufactured by Foster-Wheeler and Babcock & Wilcox for Shippingport Atomic Power Station and Indian Point 1.) Anyway, the separated water is returned to the reactor while the steam leaves this building area for the turbine building. 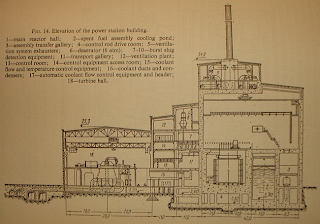 Note the recirculation pumps, "6" on the drawing. It is hard to imagine a more highly complicated primary plant design. From what I can recall most or all of those entry pipes under the reactor had a throttle valve, and part of the plant setup was to properly adjust each one of these for proper flow in the channels above. What is more, many large BWR reactors have been described as "loosely coupled" here in the US.. this reactor core is as loosely coupled as any ever built. (For you non-nuclear folks, this means that nuclear characteristics in one part of the core might be totally different, steady-state, from those in another part.) As mentioned, this core has 1693 channels for fuel, and uses about 200 control rods for various specific purposes. Here is a side view showing not only the reactor building, but the turbine building of a fairly typical RBMK-1000 reactor plant. 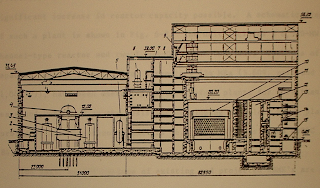 One of the most prominent features in both illustrations is the machine seen above the reactor; this is the refueling machine. The RBMK-1000 is refueled WHILE CRITICAL and ON LINE, by use of simple top covers for the channels and this large machine. It pulls out spent fuel units and replaces them with new ones while the plant produces power. Again, we must note that this sounds good until you realize that you cannot do this if you have a pressure vessel of any sort. 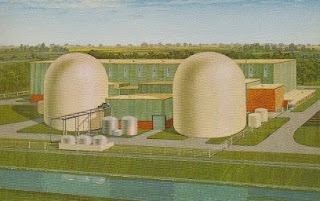 In the illustration above, the turbine building is on our left and we see the end view of the turbine and the condensers. In the reactor building, we can see to the right of the reactor a fuel cooling chamber for immediate deposition of spent fuel units, next to which is an open space between the concrete walls. Just outside of this next set of walls is actually accessible by vehicles for bringing in fresh fuel and taking out spent fuel. Yes, there are heavy concrete walls around the reactor, but access is permitted to the building through large doors that trucks go in and out of. Further as pointed out, we see just how open the plant is above the reactor itself. It should now be totally obvious to anyone why the photos of the destruction of the Chernobyl-4 plant looked so bad; nothing was there to contain the energy. When exposed to air, the graphite moderator burned fiercely. There are no reactors like this in operation anywhere in the United States. Or in Japan, for that matter.. or anywhere else in the world. Finally just for comparison, we mentioned how large the core volume of the RBMK-1000 is and to compare with a plant variant at Fukushima Daiichi, namely the BWR/4 which is that found in Fukushima Daiichi No. 2, 3, 4 and 5... The BWR/4 has an active core height of 144 inches and a core diameter of 158.5 inches. The core output of the RBMK-1000 is 3200 MWt while the BWR plants we're comparing now are 2381 MWt. Even if we step up and compare apples to apples, using Fukushima Daiichi No. 6 which is a BWR/5 at 3293 MWt the core active length stays the same at 144 inches while diameter increases to 187.1 inches. This again against the RBMK core at 275.6 inches high and 464.6 inches in diameter. Which is also full of graphite. Without any pressure vessel. Hopefully this will put the Chernobyl comparisons to bed, at least so far as plant details are concerned. Labels: "chernobyl", "fukushima daiichi", "RBMK"
Boiling Water Reactors... some further details. Fukushima Daiichi: Water in motion. 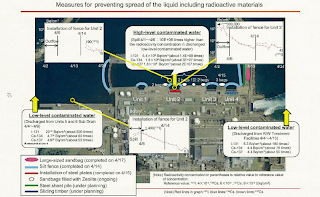 APRA Special: Observations on Fukushima Daiichi. Thursday.... JAIF data and comments related. Further details on Russian barge.. The battle over blame begins: Fukushima Daiichi.